Mr. Rosendo Garganta, CEO of Devicare, and Dr. Armando Fernández, president of ACESIMA. 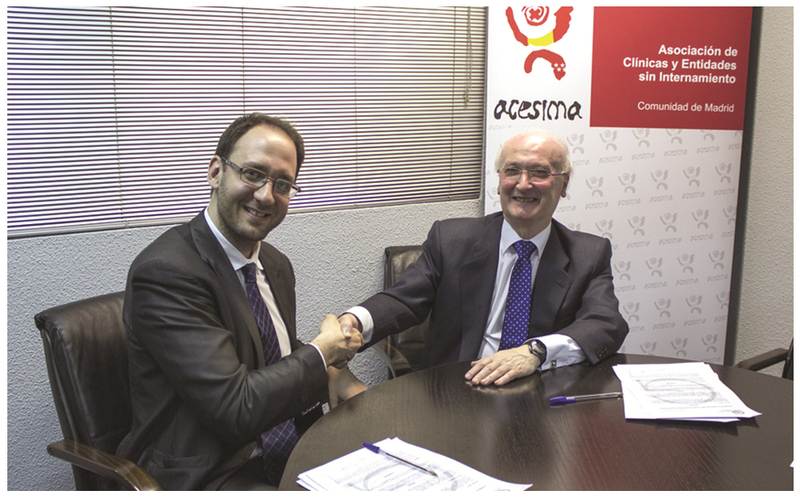 The Association of Out-Patient Clinics and Entities of the Community of Madrid (ACESIMA) and Devicare have signed a strategic collaboration agreement to promote R&D&I and the use and training of innovative healthcare services and technologies intended for the in-home self-management of chronic patients in therapeutic fields such as the cardiovascular and urological fields, among others. ACESIMA is currently comprised of one hundred private associate centres and 2,700 doctors who carry out 550,000 medical procedures every month. “As President of ACESIMA, I must express my satisfaction with the agreement we have recently signed with Devicare. Its incorporation into our associate centres represents added value in the form of greater comfort, quality and control. In essence, it improves the health of our patients. I hope this is a lasting and satisfactory agreement for both parties”, stated Dr. Armando Fernández, President of ACESIMA. Chronic diseases are becoming increasingly important in Spain (19 million people in 20161) and have triggered a rise in healthcare expenditure. “This agreement reveals the shared interest of both entities in seeking innovative solutions that optimise the quality of care for chronic patients”, says Xavier Peris, Devicare’s Sales and Marketing Director. Devicare conceives and develops medical devices for self-management of chronic diseases under the Remote Patient Monitoring (RPM) concept, “one of the major global trends not only for improving healthcare management, but also for the prevention and well-being of people who suffer from a chronic disease”, explains Peris. Thus, “one of Devicare’s main objectives is to continue advancing in research and innovation, together with prestigious scientific institutions and healthcare service managers such as ACESIMA”. The global RPM market grew 44% in 20162 and it is estimated that the number of monitored patients will reach 50.2 million in the next 4 years, 25.2 million of which will come from connected home medical devices such as those developed by Devicare. Dr. Armando Fernández, President of ACESIMA, Mr. Enrique Calvo, Manager of ACESIMA, Mr. Rosendo Garganta, CEO of Devicare, Mr. Xavier Peris, Sales and Marketing Director at Devicare, and Mr. Juan Antonio Beceiro, Head of Strategic Alliances at Devicare participated in the signing of the agreement.